Ciudad Rodrigo is located at the foot of the Sierra de Gata mountain range in the western region of Salamanca. It dates back to the Neolithic Age and was originally a Celtic village. Four centuries later the Romans occupied it, giving it the name ‘Augustobriga’ in honour of Octavian Caesar Augustus. 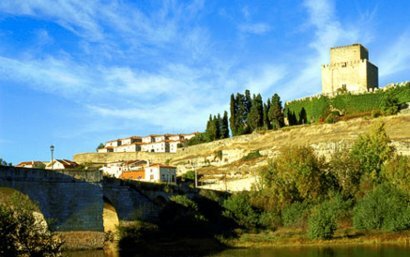 Ciudad Rodrigo is perched high on a rocky cliff top above the River Agueda. Subjected to many battles over the centuries between Moors, the subsequent rulers, and the Christians, it was eventually conquered by King Ferdinand II in the 12th century. It was one of two fortress towns that guarded the invasion routes into Spain, and it was here that the Duke of Wellington in 1812 began his initial campaign during the Peninsular War. King Ferdinand decided to protect the town from further invasion by building a wall around it, and this wall is now the main feature of the city. It is approximately 2km long with seven gates, the oldest being the Puerta del Sol and the Puerta de Santiago. 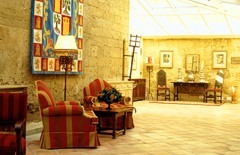 Within the walls is a 14th century castle, that has now been converted into a luxury four star hotel. The Parador Ciudad Rodrigo (Hotel Enrique II) has an impressive courtyard, a medieval dining room serving typical regional dishes, and exceptional views. It offers an ambience that is not only in keeping with this impressive fortress town, but guaranteed to make your stay a unique experience. The King also commissioned the construction of the Cathedral that actually took two centuries to complete. The main entrance is Gothic and inside there are three naves, three chapels, and the ground plan is in the shape of a Latin Cross. The town’s most affluent period was during the 15th and 16th centuries, and many of the buildings erected during that period are now Historic-Artistic sites. In the main square, the Plaza Mayor, are several buildings worth seeking out, such as the house of the first Marquis of Cerrablo, the Casa de los Cueto, and Town Hall. The Town Hall is not only a fine example of Renaissance architecture, but it also has in its archives records of the history of Ciudad Rodrigo going back 600 years. The Palacio de los Castro is another impressive building to explore with spiral columns crowned with lions. The 16th century Aguila Palace was built in the Plateresque style, and today it houses the Spanish-Portuguese Centre for Heritage Studies dedicated to the conservation of the cultural heritage of Spain and Portugal. The Palace is also a venue for many exhibitions and cultural events. If you want to explore the surrounding area there are many fascinating places to visit. The beautiful University town of Salamanca is within easy reach, and has all the advantages of the city but has retained the intimacy of a small town. Here the residents speak only the purest of Spanish, and consequently it has become a very popular place to study the language. It is extremely easy to get around on foot, and the Plaza Mayor, nicknamed the ‘living room’ of Salamanca, is where virtually everyone can be found. Other places of interest to visit are the pre-Roman settlements of Iruena and Lerilla, and the natural beauty spots of the Pena de Francia Rock and the Las Batuecas. Likewise there are trails through the surrounding countryside that you can either walk, or enjoy on horseback or mountain bikes. The best time to visit Ciudad Rodrigo is at Easter, when festivities such as the Carnival of Toro, with bullfights in the Plaza Mayor. and the Charrada Festival take place. Both are certain to make your visit a very memorable one.